Raj tents are used for both indoor as well as outdoor applications and are known for their durability and spaciousness. We use high quality fabrics, sticks, and other decorative material for manufacturing the same. Available in various sizes, shapes and design these tents are high in demand due to its rich, vibrant colours, attractive designs and appealing looks. 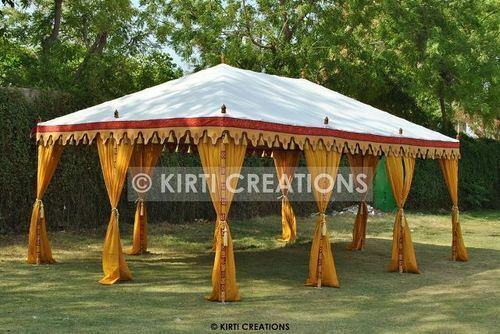 These tent enhances the look of the exteriors and gives a royal touch for any occasion. They are immensely used in various occasion for decoration. Raj tents are light weight and water proof. This Lavish Raj Tent are made of an intricate cut work and adorned with breathtaking designs and vibrant colors. Lavish Raj Tents show off beautiful designs and amazing stitching. Intricately designed with best quality fabric, this tent features elegant graceful designs whose beauty will never fade.